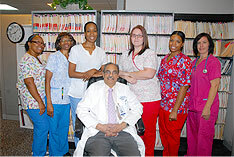 Welcome to South Atlanta Pulmonary & Critical Care Associates L.L.C and Center for Sleep Medicine, the office of Dr. Rao S. Mikkilineni, M.D.,F.C.C.P.,F.A.C.P. Dr. Mikkilineni has been providing comprehensive services in pulmonary medicine, sleep medicine and critical care in South Atlanta and surrounding areas for over 25 years. Dr. Rao S. Mikkilineni has extensive experience in treating pulmonary disease, critical care and sleep medicine. Dr. Rao S. Mikkilineni is board certified in pulmonary disease, sleep medicine and internal medicine.